Two people were killed and nearly 30 others were injured after a bus fell off a bridge here on Thursday. 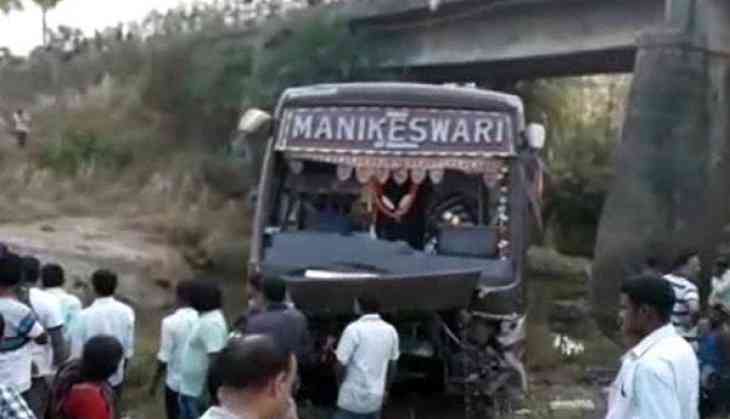 The incident surfaced earlier this morning, when the bus, travelling from Bhubaneswar to Bhawanipatna on National Highway 26, near Kalahandi area, fell nearly 30-feet below from a bridge while attempting to overtake another bus. As per the police, around 40 to 50 passengers were onboard at the time of the accident. Out of these, one child and the conductor died, while the injured were rushed to medical centers in Cuttack, Berhampur and Burla. "A bus named Manikeswari was coming from Bhubaneswar to Bhawanipatna. While attempting to overtake another bus, it fell off a bridge. There were around 40 to 50 passengers, including children and ladies. All are injured. A child and conductor of the bus died, while six persons are seriously injured. We are sending them to Cuttack, Berhampur and Burla for treatment. The situation is now under control," said Bhawanipatna Sub-Divisional Police Officer (SDPO), Biranchi Narayan Dehuri. Rescue operations are presently underway, and further details are awaited.